Dear Boo is a biweekly advice column to advise all students on the travails they face in school, work, love, and life during their time at SAIS. Have a question for Boo? Email her a question: saisdearboo@gmail.com. I am a second year student at SAIS. I have recently started to work out to get in shape. However, every hour in the gym is compensated by an extra meal. I don’t think the workout will work out. What should I do? As the one writing this while eating a huge chicken wrap, I really appreciate your effort to stay fit. 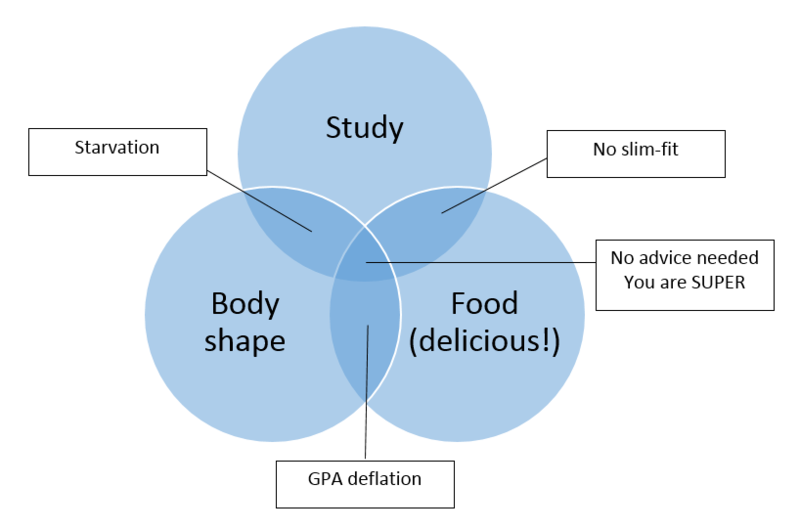 Therefore, I made a Venn Diet-gram to help guide you. You should aim for the area best-suited for you, but I always end up specializing in one area only. I hope this helps you to have an idea how to prioritize your grad life up. Still, if you are able to achieve those three goals at once, I highly would recommend you to change your major from international relations to life management, super! I recently learned my roommate is scary good at kickboxing. I am now afraid to be around her. What should I do? I recommend you put a “non-violence” sign in your place or sign a non-violence agreement with her. Otherwise, you can tell her that she should punch a sandbag, not a human being. No matter what you decide to do, just keep in mind that you should have a very polite attitude. The best situation is you two becoming really good friends so you would feel safe walking back to your place with her. I wish you good luck ;)! I am second-year DC student from Bologna who tried to introduce myself to a girl in my class at the crosswalk. Instead, when I started to introduce myself, she said we didn’t know each other and began to walk away. What should I do? Obviously, I will see her in class next week too; how should I behave? I think it is great you tried to befriend her. Judging from your question, I cannot figure out why she acted so. Should I go and ask her? Or do you think she may not like to talk to me either? How sad…But in all seriousness, it is great that you at least tried to befriend her and get out of your Bologna bubble. As for your specific issue, I cannot think of any proper advice, and it may be up to your luck. For example, if she drops her stuff in front of you, you can help her to pick it up, so you can start your conversation in a friendlier atmosphere. Otherwise, just expect a sort of Hollywood movie situation!